This was a really tricky shot to get. My daughter had her bubbles out and I had my camera out there too. You couldn’t use auto focus as most of the time the lens battled to pick up the bubble, so I had to use manual focus. That was tough as I had a zoom and a very shallow depth of field (small f number), which meant if it wasn’t bang on then it would be out of focus. So I was panning, zooming and focusing all at the same time. Anyway it did work out OK in the end. To me this bubble really represents us humans even if we are not aware of it. What is the bubble made of? It is made of nothing!. The outside of the bubble (skin) is simply a fluid, but inside it is nothing but air. When the bubble fluid is still in the bottle it is not a bubble, it is just the liquid. Together with the air it becomes a bubble. The air is the bubbles true essence and what makes it beautiful. At the subatomic level of that air, is the stuff we are all made of. Energy. It is in all of us, all around us and is us. It is our true essence and is life. However the skin of the bubble gives it its physical appearance, but the bubble is not the skin right? For me that bubble skin represents our false self or Ego. What do I mean by that false self or Ego? Think of that bubble skin as that what defines us. We usually define ourselves in many different ways such as, by the schools we attend, the cars we drive, the jobs we have, the titles we have, the qualifications we have, the salary we earn, the clubs we belong to, what our children achieve, what we achieve on the sports field, what political parties we belong to, etc. That is our false self just like the bubble skin. But that skin that is the false self is so thin and fragile, that we tend to protect this false self because we think it is our trues essence and our very existence. And this is why people react and blame when their thin and fragile false self is threatened. 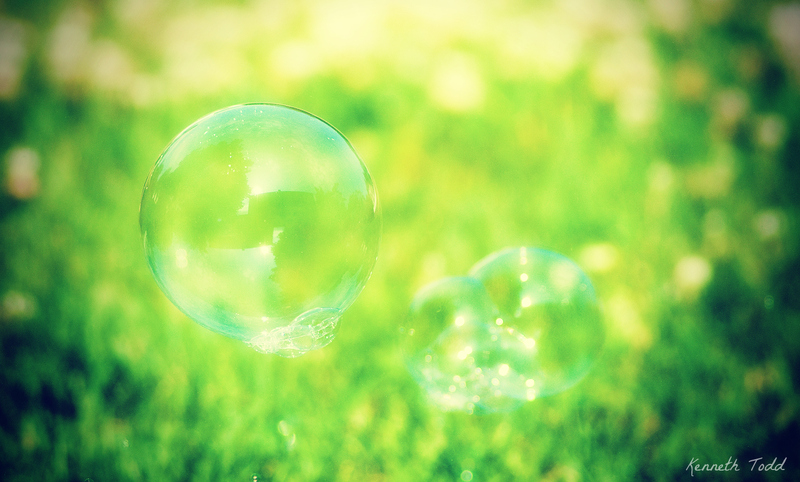 If we pop the bubble it is no longer a bubble, but it’s true essence (energy and life) is still there. So if you were stripped of your house, your job, your title, your bank accounts, you country clubs, your child achievements etc. What would you be? Pretty humbled for one I am sure. However, it doesn’t mean you’re dead, although to some it may feel that way. All those layers and labels being popped, will simply allow your true essence to be revealed. With a big caveat however! Only if you allow it. The problem arises in my opinion, because our society makes sure we are defined by all those labels and things, so when your bubble is threatened your Ego kicks into high gear. When someone or something threatens your job, or bank account, or child achievement, or social status, your false self or Ego kicks in and tries to defend at all costs. You REACT. You are trying to stop the bubble skin from being pricked. And this is where you have a choice. You have all the power in the world – yes YOU. You choose how to react. Typically when threatened people become filled with fear and/or anger and they start to BLAME others or the situation. “It is all their fault”. “You make me so angry”. “You did this to me”. etc etc. NO! You cannot make me angry. Only I can make myself angry. That is what I mean by having all the power. Don’t give all your power away. If you believe that someone else can make you angry (I am not saying condoning bad behavior) and you blame others, that means they are responsible for your own happiness. Only when they change, will you then be happy. That is crazy because we will spend our lives trying to get other people to change so that we can be happy! That is insanity. So we actually have the power. We choose how to react and we stop the blaming. But in order to do that, we need to be aware of what is causing us to react. The false self or Ego is the cause. That little layer of bubble skin all fragile and thin. This is not always easy to do and we are challenged with these situations almost everyday of our lives. However as long as you are consciously aware of how you are reacting, then you are in a powerful position. Because you are now aware and you have a choice. That is knowledge and real POWER. Power over yourself, that is not dependent on others. I have found over time and with a little practice this really works. You will even remove yourself from environments that you believe are not healthy for your own self, instead of reacting, blaming others and causing conflict. I love what Dr Wayne Dyer once said about a patient that came to see him. She sat down and blamed her Mother and Father, neighbors, friends, colleagues and every one else for her problems. He said to her. “OK. Why don’t you go round up all those people and bring them here. I will treat all of them and all your problems will then go away!” Brilliant! OK, that is all I can write for now. I am shattered. I have embedded one of my favorite songs for this post. And old R.E.M. song called Bang and Blame. Enjoy. Wow! The part about rounding up all the “others.” Yep! Came across that today. Great post. Thanks for your insight. Awesome! Awesome photo and Awesome wisdom! i love the photo and I would say interesting approach ! love the bubbles shot and thanks for sharing your thoughts!